I guess I should tell you what I do first, so you understand why I do what I do. Or maybe I should keep you guessing. And I need to tell you that this idea came from my dear friend Leslie Kawai. So thank you, Leslie — it’s changed the way I think about Valentine’s Day. Because remember, it’s not all about me, or you. It’s about the people we love. 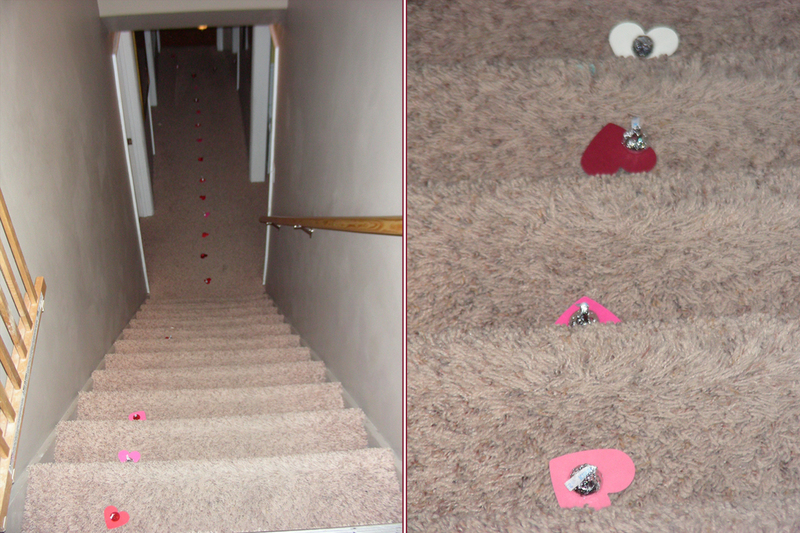 This is our kisses trail that leads from each child’s bedroom to our kitchen table. The kids look forward to seeing the kisses trail every year and get so excited about something so simple. I love that they love it. I used my large heart craft punch to make the heart shapes on red, white and pink cardstock. Then I put hershey’s kisses on each heart. 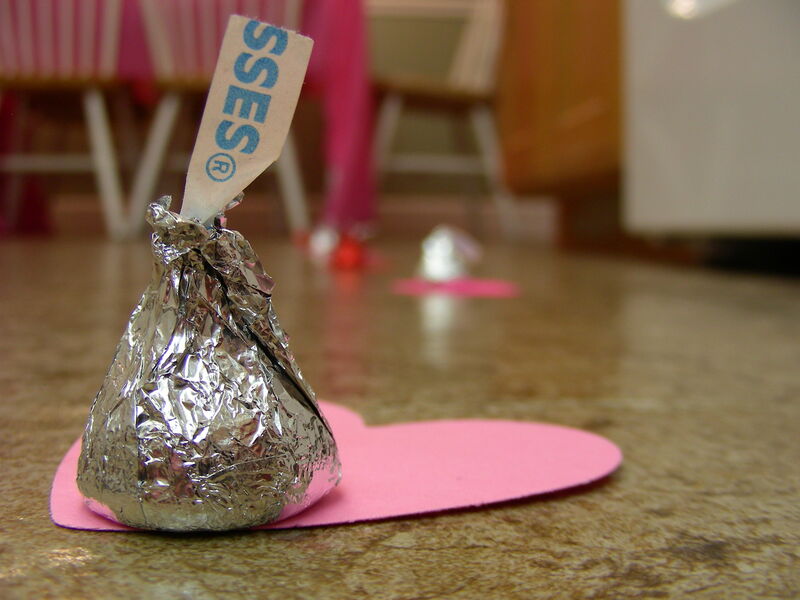 I re-use the hearts every year, but not the hershey’s kisses. I buy those fresh (in case you were wondering). And the best part? It’s all paper products so I can just throw it away when we’re done! 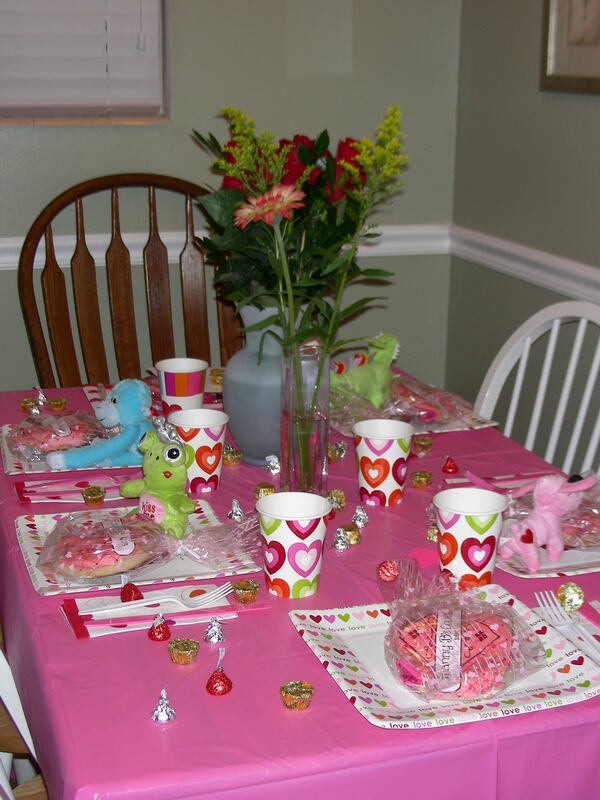 We have a fancy breakfast for Valentine’s Day, complete with chocolate milk (yum). On each child’s plate is some type of cheap stuffed thing (thank you, $1 section at Target) as well as a card and maybe a special treat. And this is the best part…written inside each card are specific reasons why we (me and Curtis) love them. It’s great to say what you love about a person, and that’s a good habit to get into, but spoken words can easily be forgotten. That’s why I like writing it down and it’s something they can keep for years to come. For my husband and myself, we usually buy flowers, exchange cards and then either go out to dinner or make a fancy dinner at home after the kids are in bed. So that’s a typical Valentine’s Day around here. Now to be ready for it. I really make life simple for him…he has no idea. OK, so you’ve got your shopping list. If your budget is anything like mine, I have to split up my purchases between a couple paychecks. But it’s not a problem because I have my list and I start early. No more running to the store the night before or the day of trying to find non-existent Valentine’s Day stuff and then coming home frazzled and disappointed. And now it won’t be you either! So go make your list and start buying now (realistically you should start in January). And remember, pick out the best card for yourself. Because it’s all about you. Oh wait — no it’s not. But it doesn’t hurt to get a great card! This entry was posted in Holidays, Organizing and tagged cards, kisses, valentine's day. Bookmark the permalink. Love it! We’re DEFINITELY doing this next week! Thanks for the fantastic ideas! You’re welcome! And I haven’t forgotten your request for taming stuffed animals! This is soo cute! You are such an awesome mom! I will have to remember this for next year. We did have a nice V Day breakfast but I love the KISS trail and the cute table set up!